Jim has been an important part of regular strategic planning and the goal setting process at R. L. Polk & Co. He has provided us with structure, challenge and insight while maintaining accountability across the senior management of our company. Working with Jim is not for the faint hearted, as he is willing to ask the tough questions. 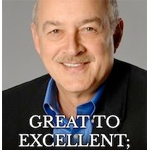 I can heartily recommend Jim for your business strategy and planning efforts. Leaders know that their #1 competitive advantage is their … Read More... about Execution Challenge: Invest or Let Go?